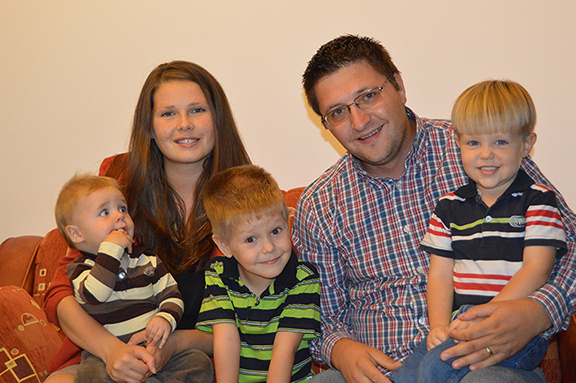 Florin (Csika) and Ana Tamas grew up in a Baptist church in Bucharest, and met the Lord at an early age. They have been working with the ministry in Fundulea since they were still in high school. They got involved as leaders for the youth and children’s meetings, and after high school went to the Word of Life Bible Institute in Hungary to study. Florin returned and graduated from the Baptist Seminary in Bucharest. The Lord has involved them in the ministry full time since their return. They were married in 2007 and the Lord has given them three boys, Abel, Andrei, and Alexandru, and one precious girl, Flavia. Florin has served as a deacon and minister for many years. They are presently living in the town of Florica at the location of our church plant. Florin was recently ordained to lead the preaching ministry at Hope Baptist Church in Fundulea while Gerald Ziemer is on furlough. They have also been key in leading the ministry in Valea Argovei over the last 18 months as Pastor Ion Bordea has been recovering from his head injuries due to his accident. Florin is leading men’s prayer meetings, and Bible Studies in Fundulea, and working with the team God has given to lead this ministry. Please be in prayer for them as they lead Hope Baptist Church to reach out to new areas of ministry, and strengthen the body of believers God has brought to Himself. They are very thankful for the prayer and support of the wonderful folks associated with the Philippian Fellowship. God continues to bless, to Him be the glory!